Allergy occurs when Ketu is exalted or Ketu is in water or fire element. Allergy occurs when Ketu is affected by Mars or Shani. Many people get spots on body when they smell onion. 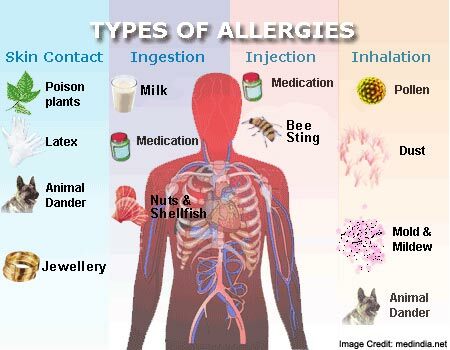 Many people get allergy after having flour products. It is known as wheat allergy. This problem increases. Many children breath become heavy when they go outside. This allergy occurs when Ketu is in fire or water element. Ketu creates many problems in skin. Many times skin becomes dry. Then skin gets irritation. This problem does not spread but it disturbs the person. Sometime, it is cured through many medicines but it cannot cure completely. Mercury also creates allergy. When Mercury is weak then one gets allergy from childhood. They suffer with cough and skin gets black or white. Children get stomach worms. This creates problem. Mercury creates dermatitis. They face problem after using others blanket. Many times people face closed nose problem. This happens due to weak Mercury. One gets severe headache that he cannot speak. Many times, their career comes at stack. When Mercury is weak then one gets ring worm, itching and psoriasis. Blood comes out during itching. This problem increases when water touch on the skin. Ketu does not spread the disease while Mercury spread the disease. Ketu and Mercury are responsible planets for allergy. When Sun is weak then it weakens the bone or creates stomach problem. This also increases gall problem. Allergy problem arises through Mercury and Ketu stays for long time. One might have to avoid many things. Many times, little use of yogurt creates many problems in throat. One should does remedy of Mercury and Ketu to avoid allergy. The pollution increases therefore, stay clean and clear. Many times dirt goes inside the body and creates diseases. This increase intestine, liver and lung diseases. The fog from car, factory and construction affects the health. Passive smoking also impacts on our health. The polluted river also creates allergy. When the water is not clear it creates stomach problem. One should take medical advice. Clean the water tank once in month on Shukal Paksha’s Wednesday. Serve cow on Wednesday. You can also arrange food, for whole month, to cow on Wednesday. Mix 5 urad in water, chant “Om Namah Shivay” doing abhishek. Daily, chant “Om” for 15 minutes. This increases the immunity. On Saturday, clean barley with milk and donate it. Tie white sandalwood and root of ashwagandh in blue color thread and wear it in throat on Saturday. Try to serve any kinnar once in a month on Wednesday or Saturday. Take mud from those farm where cow and bullock leaves. Filter it and apply it on your body. Leave it for half an hour and wash it with lukewarm water. Do this remedy on every full moon day and new moon day.